Ordering Notes: 1-2 week shipping leadtime. For 20+ rolls, use UPS Freight LTL during checkout for special shipping rates. 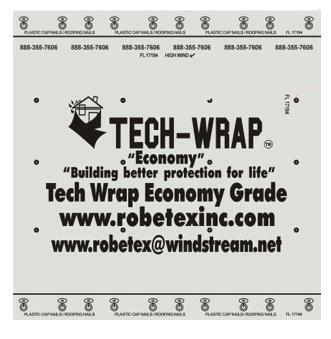 DESCRIPTION: Tech-Wrap 150 ECONOMY, 100% Polypropylene synthetic underlayment offers offers a strong, secure, and safe alternative to conventional roof underlayments. Gray/Black color.